Why am I responding to Mr. Calahan’s critique? Because one of my readers asked me to. Why am I responding at length? Because the terribly false, unbiblical, and unloving beliefs that “Christian” leaders such as Mr. Calahan and his Calvinist comrades teach are destroying Christianity and driving millions of thoughtful, good-hearted people away from Jesus Christ and the Bible. 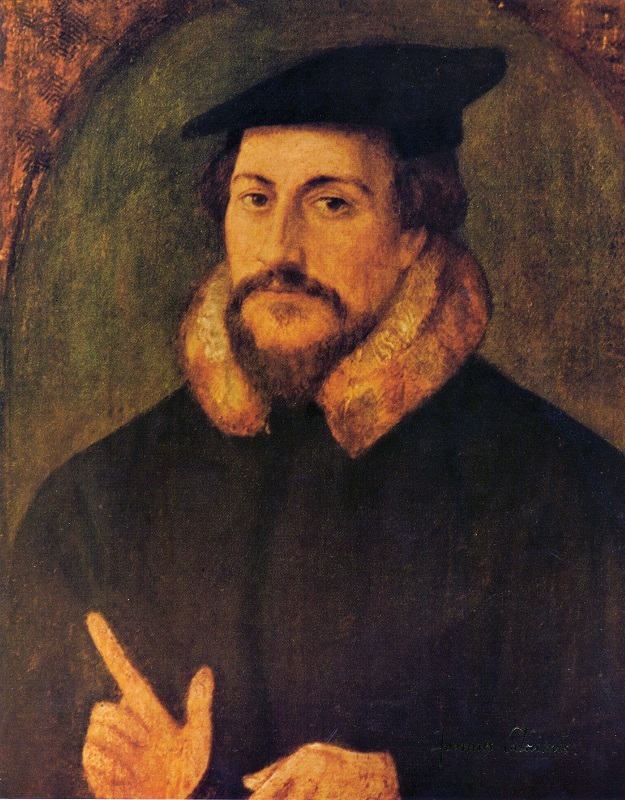 John Calvin (1509–1564) took Martin Luther’s newly invented doctrine of justification by faith alone and made it even worse by adding doctrines such as total depravity and predestination to create a highly toxic mix. The most insidious and blasphemous element of Calvin’s doctrine is the assertion that God had already chosen before Creation who would go to heaven and who would go to hell. Calvinists say that God created most people specifically for eternal torture in hell, regardless of how good and loving they may be. Mahatma Gandhi, they say, is now roasting in the eternal flames of hell because God had already decided that Gandhi was going to hell long before he was born. When thoughtful, good-hearted people today hear these unjust, bigoted, and hateful beliefs being preached in the name of Christianity, they run as fast as they can in the opposite direction. It’s bad enough for the Lutheran branch of Protestantism to say that only people who believe in Jesus are saved, and most of the world’s population is going to hell. But the Calvinists say you don’t even have a choice. God sends most people to hell just because that’s what God wants to do. And we humans have no right to question God’s outrageous actions. This is nothing like what Jesus teaches in the Bible. It blasphemes the name of God. It misrepresents and slanders Jesus Christ and every other teacher in the Bible. That’s why young people today are fleeing Christianity in droves. They are either becoming “spiritual but not religious” or are moving all the way over to agnosticism and atheism. And that’s why I am responding at length to Mr. Calahan’s article. The author, Pastor-teacher John Calahan, served for ten years as an elder at Grace Community Church in California. That church is not affiliated with any denomination, but it teaches a Calvinist theology. Calahan’s own statement of faith is also Calvinist in its views. I have nothing personal against Mr. Calahan. I don’t believe he is going to hell or sending people to hell. I’ve never even met the man. Based on the personal statements on his website, he seems to be a decent, thoughtful, and dedicated person. Unfortunately, the Calvinist doctrines that he teaches are driving millions of people away from Christianity. It’s easy enough for Mr. Calahan to lob a grenade in my direction. His article is not long. But the fragments of that grenade fly everywhere. They mislead people, ripping through their minds and hearts and causing emotional and spiritual damage everywhere they go. Every week, and sometimes every day, I hear from people who are confused, struggling, fearful, and even suicidal because of the things their “Christian” churches and pastors have told them. That’s why I have chosen to respond to Mr. Calahan’s critique carefully, point by point, Bible passage by Bible passage. I don’t expect Mr. Calahan and his fellow Calvinists to change their minds. I’m not writing this article for people whose minds are already made up. I’m writing it for people who want to believe that God is good and loving, and that their own life is worthwhile and meaningful, but who have gotten the message from “Christian” preachers that they are nothing but miserable, worthless pieces of . . . manure (that’s the “total depravity” part), and that there’s nothing they can do about it because God has already decided they’re going to hell (that’s the “predestination” part). My response is long—much longer than Mr. Calahan’s piece deserves. But his critique, with its Bible quotes and references, provides an opportunity to correct many mistaken notions about what the Bible says. It provides an opportunity to offer to you, my readers, a better and deeper understanding of the good, loving, and practical message of the Bible. You may not want to read this article all at once. I invite you to use it as a Bible study to arm and equip yourself against the fallacies and false interpretations of a false “Christianity” that has been confusing people’s minds, hearts, and lives for hundreds of years. The article, Faith Alone Does Not Save . . . No Matter How Many Times Protestants Say It Does was written by Lee Woofenden. Unfortunately the author is a false teacher and demonstrates his inability to handle scripture accurately. He is a pastor of a church in a cult. Therefore, the author’s teaching is tragic and is a hopeless promise of eternal life in heaven. He is sending people to an eternal condemnation. Man cannot earn his salvation by good works. Meh. I’m used to it. Biblical literalists tend to be intolerant of those who don’t agree with their beliefs. And they just love throwing around the “cult” charge, without bothering to learn much about the people whose character and churches they are smearing. Just for the record, it has been over a decade since I served as pastor of a church. However, I did serve for ten years as pastor of a Swedenborgian church in a mid-sized New England town. Even before I began my pastorate there, the congregation was an active and respected member of the local Council of Churches. (My denomination also belongs to the National Council of Churches of Christ in the USA.) I served as President of the local Council of Churches for several years. During my time on the Council I worked hard to bring together all of the churches and pastors in town—Catholic, Protestant, Christian Science, and Unitarian, not to mention local Jewish and Muslim faith leaders—to strengthen our spiritual outreach into the community. Perhaps it was because my church was seen as a unifying presence among the local churches and religious leaders that when the attacks of September 11, 2001 happened, the members of the local clergy group spontaneously turned to me and asked if my church would host an interfaith memorial service. Religious leaders of all different churches and faiths participated, and our church was filled to overflowing. In short, my ministry and my church speak for themselves. Does God create the majority of people for inevitable eternal torment? This salvation is the result of God choosing men and women to believe in Jesus before the foundation of the world. Consequently, those whom He chose in Christ He graciously regenerates, saves, and sanctifies. This is followed by a whole string of Bible references, which Mr. Calahan has misread and misinterpreted according to his Calvinist belief that only that small minority of people whom God has chosen before Creation will be saved and will experience eternal life. All the rest, whom God didn’t choose for salvation, will burn in eternal fire. That’s not because they have rejected God, but because God has rejected them. This doctrine is a blasphemous smear on the sacred name of God. The Bible makes it very clear that God gives us a choice not only about our life here on earth, but about our eternal life. Yes, it is God who saves us, not we ourselves. But it is up to us whether we will accept salvation from God and go on to eternal life. There are many other passages in the Bible where God presents us with a choice between good and evil, between life and death. If we had no choice, and God had already chosen for us whether we would go to heaven or to hell, all of these passages would be a meaningless and deceptive waste of words. God has prepared a place in heaven for all who are willing to listen to God’s call to repentance and new life, and who make the choice to follow God’s way of love instead of their own greedy and selfish ways. Calvinists are simply wrong because they “do not know the Scriptures or the power of God” (Matthew 22:29; Mark 12:24). They quote a few Bible verses out of context while rejecting the clear and overwhelming message of the rest of the Bible, which shows that their heartless and cruel doctrine of predestination is both false and incompatible with the eternal love and mercy of God. Why does the Bible make it sound like God does evil? Why, then, does the Bible say some of the harsh things it does? The reason the Bible says things that make it sound like God does both good and evil is that people of simple mind and faith must believe that God is ruler over everything. The only way such people can understand this is to believe that God brings about both good and evil, both blessings and curses. It’s not that God is twisted. It’s that crooked people see God as twisted. For people who are still stuck in their selfish and sinful ways, it is necessary for God to appear harsh so that they will “straighten up and fly right,” as the old song goes. The harsh face that God sometimes shows to us is also part of God’s love and mercy toward us. But it’s not how God really is. Even people indoctrinated with Calvin’s doctrine of predestination have trouble really believing it. Not only the Bible, but all of their experience says that they do in fact have a choice about which way their life will go. Are you running from God or have you already found Him? Do you want God to forgive your sins and takeover your life? If yes, then tell Him and He will. These words have no meaning if we don’t have free will. I am sympathetic to the plight of Mr. Calahan and his fellow Calvinists. I feel for them in their confusion at the paradoxes and contradictions they see in the Bible. I find it very sad that they feel they must believe harsh things because they think that is what the Bible teaches. It is hard to preach unloving, unmerciful things from which the human heart recoils. As Mr. Calahan says in the section on “the Bible” on his “What We Believe” page, he takes the Bible very literally. And it is hard for literalists to encounter passages in the Bible that contradict one another. Because they are stuck in the letter that kills, they struggle to sort out these “mysteries” and “paradoxes” without the benefit of an understanding of the spirit that gives life (see 2 Corinthians 3:5–6). As a result, they believe and preach many unenlightened and false doctrines. Now let’s turn to Mr. Calahan’s critique, and take a walk through the Bible passages that he so badly misunderstands. This passage of scripture teaches that God is not a failure. God already knew the “success rate.” If 6.4% is the correct “success rate,” then God already knew that. It is man that has failed to believe. This reveals that Jesus knew that only a small minority would respond to the gospel. Additionally, God sovereignly choose[s] a minority for salvation (Matthew 22:14). Why? It is the mystery of election. The author’s statistical conclusion is in error. Worse, yet, he ignored Matthew 7:13–14. That passage clearly says that there are “few who find it.” Man is ultimately responsible. Only a few really do find it. That is not a reflection on God. In other words, the vast majority of people will go to hell. And that doesn’t seem to bother Calvinists at all. Mr. Calahan’s statement that “God sovereignly choose[s] a minority for salvation” is another way of saying that the reason only a few people are saved is that God planned it that way. As for the rest, God had already planned to send them to hell. According Calvinist beliefs, God’s pre-existing choice is the reason so few people find salvation. Mr. Calahan’s statement that “man is ultimately responsible” is just empty rhetoric, contradicted by his own predestinarian beliefs. Once again, I cannot believe in or respect such a cruel and heartless god, who would choose only a few for salvation, and send the vast majority of people to eternal torture. That is not the God of the Bible. Matthew 22:1–14: Do very few people get into God’s wedding banquet? The people who were invited to the wedding but refused to come represent the Jewish elite, who prided themselves on scrupulously keeping the Law of Moses and being the most righteous and holy people, chosen and blessed by God. They would not listen to Jesus’ message of salvation. The people from the streets, both good and bad, represent the common, uneducated people who listened to Jesus, became his followers, and lived according to his teachings. The man who was not wearing wedding clothes came for the food and the spectacle, but had no respect for the wedding. In other words, he represents hypocrites who pretend to follow Jesus in order to get glory and pleasure for themselves. Why did Jesus wrap up the entire parable by saying, “For many are invited, but few are chosen”? Did this mean, as Calvinists and many other traditional Christians seem to think, that hardly anyone will “attend” the “wedding feast” of heaven? That’s simply not what the story says. When the invited guests failed to appear, the king sent his servants out into the streets to gather everyone they could find, so that the wedding hall was filled with guests. Only one of them, who failed to wear a wedding garment, was ejected from the wedding. The wedding feast was filled to capacity. The original Greek has the word “are” in the first clause, but not in the second. Yes, the second clause can be read as “few are chosen.” That is how almost all English versions translate it. Leaving out the second “are” in this type of verbal construction is very common. But reading it as if Jesus is saying that very few people make it to heaven doesn’t make any sense. He would be contradicting his own story. He has just said that the wedding hall was full. How, then, do we make sense of this final line? I believe Jesus was engaging in one of his famous plays on words. If we read it in this way, it makes perfect sense. God calls many people to the “wedding feast” of heaven. But of the people who respond to that call and fill the wedding hall to capacity, very few are the people who think of themselves as God’s special “chosen ones.” They are much too busy with their own importance to listen to God’s call. That is the message of the parable. And this, I believe, is how Jesus wrapped it all up in a pithy, memorable play on words. Whether or not this was Jesus’ meaning, the common interpretation of exclusivist Christians such as Mr. Calahan just doesn’t make any sense in the context of the whole parable. The parable simply doesn’t present a picture of hardly anyone making it into heaven. Instead, it presents a picture of heaven being filled to capacity with a large and joyous crowd—just not the elite who were originally invited. In short, if we put Matthew 22:14 back into its context, it tells a completely different story than the one that the Calvinists are attempting to foist upon us. Now back to the small gate and the narrow path. Jesus didn’t say that the gate will always be small and the path will always be narrow. He said that they are (at the time when he spoke these words) small and narrow. Isn’t that exactly why God came to us? Isn’t that exactly why “the Word became flesh and made his dwelling among us” (John 1:14)? By the time Jesus came, the religious leaders had become so corrupt and had wandered so far from the truth of their own scriptures that they were actively blocking people from finding and entering the gate that leads to salvation. Have you ever walked down an old road that has not been used in decades? Even if it was originally beautifully paved, wide, and clear, over the years of disuse the weeds take over, cracking and crumbling the pavement. Thistles, thorns, and nettles grow in from both sides, closing in on one another until there is hardly room to get by. Even the entrance to the road becomes choked off and blocked by brambles and vines so that it is hard to find the road in the first place. That was the sad state of the road to salvation when Jesus spoke the words of Matthew 7:13–14. Because the corrupt religious leaders of the day were blocking people from finding and traveling on the path to salvation, Jesus Christ came to clear and reopen that path so that anyone who wanted to could find it. And God has been keeping that gate open and the way cleared for us ever since. Because Jesus has now opened the way and cleared the path, it is not only a select few “chosen people” who are saved, but a vast, uncountable multitude from every nation, tribe, people, and language. This is the plain teaching of the Bible. Even though Jesus has now cleared away human obstructions and re-established free access to the gate and the path that lead to salvation, his words in Matthew 7:13–14 continue to have meaning for us today. When we first begin on the path to salvation, it feels narrow and confined to us. We long for our old self-indulgent and reckless ways. We have to walk a narrow path of right living until the day comes when it widens out into a broad and delightful path, and we wouldn’t think of living any other way. His conclusion about the 6.4% is faulty. First, how does he know that only 20% of Christians believe that salvation is by faith alone? Did he conduct a poll such as a Gallup Poll to determine how many in the entire world believe that? Did he assume that everyone in the dominations believe that? Did he consider the thousands and thousands of independent churches scattered across the United States and the world? If so, he never tells us. I never said that only 20% of Christians believe that salvation is by faith alone. I said that “approximately 20% of Christians belong to churches that teach that faith alone saves.” I don’t know how many of the people in those denominations actually believe in salvation by faith alone. But the fact that they belong to churches that teach it when they could belong to a church that doesn’t suggests that they believe what their churches teach. In arriving at the figure of 20% of Christians belonging to churches that teach salvation by faith alone, I included all of the Protestant denominations and churches except for the Methodist and the Anglican / Episcopal churches. Unlike the rest of Protestantism, these churches have their own distinct denominational and doctrinal origins. Justification by faith alone is not a core element of their doctrines as it is for the bulk of Protestant denominations and churches that trace their origins back to Martin Luther (“Evangelical Christianity,” in the older, traditional meaning of that term) or to John Calvin (“Reformed Christianity,” in the traditional meaning of that term). Regardless of the exact figures, the point is that if it’s necessary to believe in justification by faith alone in order to be saved, only a small percentage of the world’s population will go to heaven, and the vast majority will go to hell. And even if all Christians are saved, that still means that two-thirds of the world’s population will go to eternal hell simply because they belong to a different religion. Once again, I find that to be a small, narrow-minded view that is not compatible with the plain teachings of the Bible about who is and isn’t saved. And I find it incompatible with the all-loving, all-powerful God of the Bible, who is good to all, and whose compassion is over all that he has made. Under his next heading, “Biblical Argument,” Mr. Calahan quibbles about my use of both the New Revised Standard Version (NRSV) of the New International Version (NIV) of the Bible, as if quoting from different translations of the Bible somehow calls my scholarship into question. The NRSV and the NIV are the two translations I quote from most often here on Spiritual Insights for Everyday Life. They are generally readable and reliable translations. However, no translation is perfect. Like other translations, their interpretation of the original is often bent toward the particular doctrinal stances of the translators. Therefore when dealing in detail with specific Bible passages, I commonly consult the original Hebrew and Greek texts of the Bible and choose the translation that seems to best reflect the original wording. As for the varying manuscripts of the Hebrew and Greek Bibles, I generally accept the Textus Receptus, while not ignoring other textual traditions when it might make a difference in the interpretation. Most of the time, however, the variations in the manuscripts are rather minor and do not greatly affect the meaning of the text. Besides, the overall meaning and flow of the Bible is clear enough. When an entire theological argument hinges on small variations in the manuscript, it’s usually a case of focusing on one leaf of a single tree while being oblivious to the entire surrounding forest. Does Ephesians 2:8–10 reject good works as saving? The author states that the word “works” in this passage is “shorthand for ‘the works of the law.’” His conclusion is deceptive. First, a review of Ephesians 1:1–2:7 before these two verses reveals that Paul was not talking about the Law. Since Mr. Calahan does not elaborate on this, I do not know what point he is trying to make. Of course the writer of Ephesians covers various subjects in the epistle. Not all of them are the Law. But once he gets to Ephesians 2:8–10, he is indeed talking about the Law. This is covered much more fully in my article linked just above. This is how we know that when the author of Ephesians uses the word “works” in verse 9, he means “the works of the Law.” In verses 11–13 he contrasts the uncircumcised Gentiles with the circumcised Jews. Circumcision, for Jews, is a ritual marking them as Jews. And a Jew is one who follows the Law of Moses. In other words, in the Epistles “circumcision” is shorthand for being an observant Jew who follows the Law of Moses. It’s just that simple. If you read the various places in Paul’s epistles that talk about being saved by faith apart from works, you will regularly find right nearby a discussion of circumcision vs. uncircumcision. That’s how we know by the context when Paul is using “works” to mean “the works of the Law,” or in plain terms, being an observant, circumcised Jew. We must pay attention to the context and to the entire flow of his argument to stay on top of his meaning. This is something Protestants have spectacularly failed to do in their non-contextual reading of Paul’s letters. Second, where does scripture teach that the word “works” is restricted to “the works of the law”? You cannot find that in the Bible. To the untaught Christian this sounds convincing. His “shorthand” argument is supposed to convince us that salvation is not by observing “the Law” but by performing other works. So he had to redefine the word “works” so that he can convince the reader that salvation is by works—some other type of works. But there is nothing special in the Greek word that is translated as “works.” The Greek word is ergon and it just simply means works or energy. The clear plain meaning of Ephesians 2:8–9 is that salvation is not by any works—even the works of the Law. Faith-alone Protestants have confused these three uses, mashing them together, and thus becoming hopelessly confused about what Paul teaches. They think that Paul is teaching that good works don’t save us, when in fact Paul is teaching that being an observant Jew doesn’t save us. This is all covered in my original article, so I won’t repeat it here. The suggestion that “works” (Greek ergon) has just one simple meaning everywhere it is used betrays a basic misunderstanding of language. Look in any full-featured dictionary of any language under any commonly used word, and you will find multiple definitions, some of them quite different from one another. Far from being an unusual situation, this is simply how language works. We use the same word with different meanings in different contexts. Most of the time we are not confused because the context tells us what particular meaning of the words is intended. As a writer, Paul is no exception. His letters are not limited to a single meaning of the Greek word ergon, “works.” Like every skilled writer in any language, he uses that word, and many other words, in a full range of meanings in order to express what he wishes to say in any given passage. That is why, once again, we must pay attention to the context of everything we read in the Bible, including Paul’s statements about faith and works. Both the immediate context of his statements about being saved by faith and not works and the overall biblical and historical context of those statements show that Paul was arguing, against the “Judaizing” Christians in Jerusalem, that it was not necessary for Gentile converts to be circumcised and observe the ritual and ceremonial Law of Moses in order to be saved by their faith in Jesus Christ. But you don’t have to take my word for it. Read Acts 15:1–35. It tells the story of “The Council at Jerusalem,” where the earliest Christian leaders had this very debate. Paul, Barnabas, and Peter, who were evangelizing in Gentile (non-Jewish) areas, all argued strenuously that it was not necessary for Gentile converts to be circumcised and observe the Jewish Law. They are not paying attention to the immediate context in the Bible of Paul’s varying uses of the word “works.” In most places the context makes it clear which meaning of “works” he intends. They are not paying attention to the historical and doctrinal context in which Paul’s letters were written, thus completely misunderstanding and misapplying his meaning and his argument. They are ignoring large segments of Paul’s letters, including the bulk of Ephesians itself, in which Paul gives detailed instructions on how to live. If Paul believed that we are saved by faith alone, why would he put so much emphasis on not sinning and living a good life instead? In their fanatical devotion to faith and faith alone, they are ignoring the fact that Paul himself puts love ahead of faith (1 Corinthians 13:13). And notice that in this passage Paul tells us how Jews and Gentiles—who are not Christians—will be saved or condemned according to what they have done, under the principle that “God does not show favoritism.” The Bible flatly contradicts the false doctrine of those Christians who believe that only Christians are saved. And if Paul were actually teaching elsewhere that we are saved by faith alone and not by our good works, he would be flatly contradicting himself. Not a single passage in the entire Bible says that we are saved or justified by faith alone. Not in Paul’s letters. Not anywhere else in the Bible. Mr. Calahan and his fellow faith-alone Protestants are simply wrong about salvation by faith alone because they do not know the Scriptures or the power of God. Should we all just be Roman Catholics? The author’s historical argument is that the reformers made a big mistake by teaching that salvation was by faith alone. If that is true then the reformation should never have occurred and we should all be Roman Catholics. He would either be a Roman Catholic priest or none at all. This only shows the narrow confines of Mr. Calahan’s view of Christianity. In the Protestant West there seems to be a simple, binary view of Christianity: you’re either a Protestant or you’re a Catholic. Never mind that there is an entire third major branch of Christianity—the Eastern Orthodox Church and Eastern Christianity generally—that predates Protestantism, and has roots going back as far as those of Catholicism. Never mind that there is a multitude of other small Christian churches that are not part of any of the three major branches of Christianity, some of which also trace their history back to the earliest centuries of Christianity. Given the great corruption that had come to exist in the Roman Catholic Church by the sixteenth century, the Protestant Reformation was probably inevitable. That doesn’t mean that its signature doctrine, justification by faith alone, is correct. Only that it provided a doctrinal issue on which Luther and his followers could make a complete break from Roman Catholicism. What happened next was that Protestantism itself progressively fragmented and splintered into dozens of major denominations, thousands of smaller denominations, and tens of thousands of independent churches, each distinguished by its own particular doctrinal stance, and each claiming that its doctrinal position is correct and every other church’s doctrinal position is incorrect. Although the Protestant Reformation was probably inevitable, all it did doctrinally was to take Christianity out of the frying pan and into the fire. The author concludes that there is no purpose in life if one is not working for their salvation. Again, the author is guilty of false teaching. I do point out in the article that the bulk of our life is spent engaging in the daily tasks of our job, our home and family life, our community, and so on. And that if the only thing that really matters is believing in Jesus, the vast bulk of our life is wasted. If all that matters is believing in Jesus, why doesn’t God arrange to meet all of our physical needs so that every Christian can spend every waking hour evangelizing and making converts? This would be the most sensible way for God to arrange things here on earth if Mr. Calahan and his fellow Protestants were right about salvation by faith alone. Instead, we find that God has arranged our life here on earth so that we spend the bulk of our time working and doing good deeds—good works—for our fellow human beings, just as Jesus taught we must do if we wish to be saved. See Matthew 25:31–46. 1 Corinthians 10:31 gives us our primary reason for living. Our purpose is to glorify God. Our other purpose for doing good works is to use our spiritual gifts in ministry to others (1 Corinthians 12 and Hebrews 6:10) and to share the gospel (Matthew 28:19–20) so that they find the narrow way (Matthew 7:13–14). I don’t have any particular argument with this. I will simply note that even Mr. Calahan includes doing good works for others in his list of purposes for our life. Even Protestants who intellectually believe in justification by faith alone cannot run away from the biblical reality that it is how we live, not just what we believe, that determines whether we will spend eternity in heaven or in hell. That’s why even though Mr. Calahan believes that I am “sending people to an eternal condemnation” by what I teach here on Spiritual Insights for Everyday Life, and probably thinks that I myself will go to an especially hot hell when I die, I believe that Mr. Calahan and his followers will find their home in heaven if, despite the unbiblical and false doctrines he is teaching them, they actually live by Jesus’ commandments to love the Lord our God with all our heart, soul, mind, and strength and to love our neighbor as ourselves (Mark 12:28–31). The author misapplies numerous passages revealing a lack of biblical scholarship and broad, balanced understanding of scripture. The following passage summarizes the teaching of scripture that salvation is by faith and NOT works – the law or otherwise. The passage clearly says that those who have faith are declared righteous or godly. These individuals are going to heaven. It is not by works. Paul started this discussion in Romans 4:2 about Abraham. That is, this is in reference to Abraham. Then Paul goes on to teach that this principle was established before the Law was even given to Moses (Romans 4:10–12). Paul was not talking about works of the Law in Romans 4:5–6. And Paul’s argument continues in that vein. He is saying that Abraham was saved by faith before he was circumcised, and before the Law (of Moses) was given. Once again, Paul is not arguing that good works are not necessary for salvation. Once again, the context shows that by “works” here Paul means “the works of the Law,” or being circumcised and being an observant Jew. In short, Paul is arguing here, as elsewhere, that it is not necessary to be an observant Jew in order to be saved. Once again, Mr. Calahan and his fellow Protestants have completely misread and misunderstood Paul because they have not paid attention to the context and have therefore mashed together and confused the different meanings of “works” in Paul’s letters. James 2:24 is not a statement that teaches a person needs to work in order to be saved either. The author conveniently ignores James’ conclusion in verse 26. The conclusion clarifies the message of the author. Real faith is revealed by the works a person does. That is, faith will result in good works. This false teacher fails to see the distinction. John 1:12 and 3:16 do not include any statement about works in order to gain eternal life. The thief on the cross could not perform any good works in order to get saved. Yes, James says in verse 22 that Abraham’s faith was brought to completion by his works (not “revealed by his works,” as Mr. Calahan says). But he also says in the previous verse that Abraham was justified by works. And he says that Abraham faith was active along with his works (which contradicts the Protestant notion that works follow or result from faith). Mr. Calahan accepts only one of these statements (which he rephrases to fit his own doctrine), and rejects the other two. But James is very clear that we are justified by works, by faith, and by both of them working together, flatly contradicting Mr. Calahan’s faith-alone doctrine. This is the one and only passage in the entire Bible that mentions faith alone . . . and it specifically rejects it. I wish Mr. Calahan and his fellow Protestants were as honest about this passage as the founder of Protestantism, Martin Luther, was. Luther recognized that the Apostle James contradicted Luther’s newly invented doctrine of justification by faith alone. That’s why Luther attempted (unsuccessfully) to get the Epistle of James, together with three other New Testament books that he deemed insufficiently supportive of his new doctrine, removed from the Bible. See Hebrews, James, Jude and Revelation in the Wikipedia article on Luther’s Canon. Luther had such contempt for the book of James that he called it an “epistle of straw” (see the quote from Philip Schaff in the “Sola fide doctrine” section of the same Wikipedia article). At least Luther was honest in rejecting books of the Bible that didn’t support his doctrine. Ever since Luther was unsuccessful in removing those books from the Bible, Protestants have been contorting themselves to explain away the one and only place in the Bible that actually mentions faith alone. That one passage is James 2:24. Mr. Calahan has his own page in which he takes his stab at explaining away the Bible’s flat rejection of the false doctrine of justification by faith alone. Here it is: “What is the meaning of James 2:24?” I find it entirely unconvincing. In fact, for me it has become almost a sport to read the mental gymnastics and observe the amazing doctrinal contortionism of the various “learned” Protestant teachers as they bend James’s plain and clear statement into all sorts of uncomfortable shapes and sizes in their attempt to force it to fit their false doctrine. Unfortunately for them, as Luther himself recognized, James flatly contradicts and rejects the key defining doctrine of their entire branch of Christianity. If Lutherans and Calvinists were as honest as Luther, they would simply reject any book of the Bible that doesn’t support their doctrines, and be done with it. The only problem is, they would have to reject every single book in Bible. James explicitly rejected justification by faith alone. If Paul had wanted to say that we are saved or justified by faith alone, he had the vocabulary and the writing ability to do so. But he never did. And Jesus never taught anything remotely like salvation by faith alone. These are the simple facts of the matter. Some Christians think that the letters of Paul and James contradict one another. But the reality is that neither one of them taught faith alone. Both of them taught that we will be judged for eternal life based on our good works as well as our faith. Paul never said that we are justified by faith alone because Paul believed no such thing. The plain and simple fact is the Bible never, not even once, says that we are saved or justified by faith alone. But Mr. Calahan and his fellow Protestants simply ignore that fact. And they engage in amazing verbal contortions to explain away the Bible’s clear rejection of justification by faith alone, while misreading and misunderstanding all of Paul’s teachings about salvation. Instead of accepting the plain and simple teachings of the Bible, they have accepted the complicated human-invented doctrine of Martin Luther. And though they are less honest about it than their founder was, like Luther they reject and explain away anything in the Bible that contradicts that doctrine. They “abandon the commandment of God and hold to human tradition” (Mark 7:8). The reality is that the entire Bible, from beginning to end, contradicts and rejects their false doctrine. The entire Bible tells us that if we wish to be saved, we must repent from our evil deeds and do good deeds instead. Our faith in Jesus may teach us and lead us to do this, but it is the actual repentance from sin and the doing of good works that is the substance of our salvation. Are We Saved in an Instant? How was the Thief on the Cross Saved? The author is a false teacher who twists the scripture for his own purpose. He ignores the truth that no one can do good works, not even one (Romans 3:10–12). Once again, Mr. Calahan is engaging in a basic misreading and misunderstanding of the Bible. Romans 3:12 doesn’t say that no one can do good works, as Mr. Calahan asserts. It says that no one does do good works. There’s a big difference! As shown in the bracketed references, Paul quotes a whole series of passages from the Old Testament about the extreme corruption of humankind. But not a single one of them says people cannot do good or be righteous, as Mr. Calahan claims. Rather, they state that people are not doing good or being righteous. Paul’s argument here is completely different than the one Mr. Calahan is making. Paul is saying that even though the Jews have had the Law of Moses for many generations, they have become corrupt and wicked, and their Law has therefore lost its ability to save them as a people, but only demonstrates how corrupt and sinful they are. This is what Jesus himself says about the Jewish leaders of his day in many biting passages, such as the “Seven Woes” in Matthew 23:13–38. It’s not that they couldn’t follow the Law. Even though there are many commandments in the Law of Moses that seem very harsh and unreasonable to us in today’s culture, there is nothing in that Law that the people of its time and culture were incapable of obeying. God does not give us commandments that we are unable to follow. God does not set us up for certain failure. But the reality was that as time went on and the generations passed, the ancient Jews didn’t obey the Law. Over time, as Paul said, the Law itself became a testimony against them of their own sinfulness. Jesus regularly quoted from the Law to show how far from obeying the Law the Jewish leaders of his day were. It was when their corruption became so great that even people who wanted to live a good and righteous life could not do so—because the Jewish leaders had “shut the door of the kingdom of heaven in people’s faces,” and would not “let those enter who are trying to” (Matthew 23:13)—that it was time for God himself to come as Jesus Christ in order to provide a new path of salvation for those who longed for truth and righteousness. This is what Paul is saying in Romans 3:9–20. He is saying that the era of the religion of the Jews, based on strict, literal, behavioral adherence to the Law of Moses, had run its course and come to an end. Its leaders had become altogether corrupt, and their religion could no longer bring salvation to the masses of people. Paul is saying that a new spiritual path based on following Jesus Christ and living by his teachings out of faithfulness to Jesus (not “faith” as that word is understood today) was replacing the behavioristic, law-bound Jewish religion as God’s leading religion on earth. Once again, Mr. Calahan and his fellow Protestants have completely misread and misunderstood Paul’s argument in this chapter because they do not understand the biblical and historical context of Paul’s writings—or they choose to ignore it. If works were required how could anyone save themselves? Consider the rich young ruler who asked Jesus what he had to do in order to gain eternal life (Matthew 19:16–26). Jesus replied that there was only one who was good—God. Therefore, the author’s teaching is tragic and is a hopeless promise of eternal life in heaven. He is sending people to an eternal condemnation. Man cannot earn his salvation by good works. Every single thing Jesus said to this rich young man was a commandment to do good works in order to be saved! Instead, he gave the rich young man another, even greater good work to do: Sell all of his possessions, give to the poor, and come follow him (Jesus). Was this impossible for the rich young man to do? No. If he wanted to be “perfect,” or as that word really means in the original Greek, complete in his quest for eternal life, he must devote all of his wealth to providing for the poor, and devote his own life to following Jesus. Nowhere in the entire story did Jesus say anything at all about merely needing to believe in him in order to be saved. Instead, he spoke of how difficult it is for rich people to enter the kingdom of heaven—because they are unwilling to do what is required to enter it. And yet, he ended by saying that even though “with man this is impossible, with God all things are possible.” And the Gospels do tell us of rich men who were saved based on what they did in following Jesus, including Zacchaeus (see Luke 19:1–10) and Joseph of Arimathea (see Matthew 27:57–61; Mark 15:42–47; Luke 23:50–54; John 19:38–42). There is a strange doctrine-induced blindness evident in Mr. Calahan’s referring to the story of the rich young man to support Luther’s doctrine of justification by faith alone. The rich young man gave Jesus a golden opportunity to say that all he had to do was believe in Jesus, and Jesus said no such thing. Instead, Jesus repeatedly told the young man that if he wished to be saved, he must do good works. Jesus, like Paul, James, and every other teacher and prophet in the Bible, not only didn’t teach Martin Luther’s doctrine, but rejected its entire premise. Man cannot earn his salvation by good works. That’s true! People who think they can buy their way into heaven by doing good works are sadly mistaken. If we think we can buy our way to heaven by doing good works, we are stealing from God. We are claiming credit for our good works when it is actually God who gives us the power to do them. When we do good works for any or all of these reasons, we are being faithful to the teachings of Jesus Christ, and to the teachings of God throughout the entire Bible. That faithfulness to Jesus—not some intellectualized “faith” in some Protestant doctrine about Jesus—is what Paul means when he says that we are “justified by faith apart from the works of the Law” (Romans 3:28). Mr. Calahan is correct when he says that “man cannot earn his salvation by good works.” But his faith alone doctrine prevents him from seeing and understanding that when we do good works out of obedience, faith, and love, these are the works of God in us that contribute to our salvation. And because Luther’s false doctrine prevents Mr. Calahan and his fellow Protestants from seeing and understanding what the Bible teaches about faith, works, and salvation, they throw the baby out with the bathwater. If you are honestly seeking the true teachings of Jesus, the Bible, and Christianity, I invite you to “search the scriptures” for yourself (John 5:39). Search diligently for even a single place in the entire Bible where it says that we are saved or justified by faith alone. You will not find one. Read the Bible from beginning to end, and you will see that everywhere from Genesis to the Book of Revelation it says that if we wish to be saved, we must repent from our evil deeds and do good deeds instead. Moses says it. The Prophets say it. Peter, Paul, James, and John say it. And most of all, the Lord Jesus Christ says it. And notice that throughout the Bible, God presents us with a choice of whether to follow God’s way or our own way, and tells us what the consequences of each choice will be. Do you believe the Bible teaches Martin Luther’s doctrine of justification by faith alone, and that anyone who has the “wrong” religion will go to hell for all eternity? Do you believe the Bible teaches John Calvin’s doctrine that our free will is an illusion, because long before we were born God had already decided which of us would go to eternal life in Paradise and which of us would endure eternal torment in hell? ‹ How has Religion become a Justification for Murder? Very thorough, insightful and thought provoking piece above. It is true that “Christians” have largely abandoned the teachings of Jesus in favor of so many man made ideas over the centuries, and there is thus much confusion and contradictions among the nearly 30 thousand denominations, sects and splinter groups all claiming to be “Christian”. One may wonder if the Protestant Reformation (or Rebellion) would have been possible without the invention of the printing press a few decades earlier. That invention allowed the printing of the Bible in large quantity. Thanks for your thoughts and for your kind words. I’m glad you enjoyed the article. As I said in the article, although I don’t think the Protestant Reformation improved anything doctrinally, I do think it was inevitable given the low state of the Catholic Church at that time. Even doctrinally, in my view, Catholicism had already veered heavily away from biblical teachings from the time of the eleventh century when Anselm first proposed the satisfaction theory of atonement. Protestantism simply took that and ran with it in its own direction—penal substitution. So in my view, Catholicism set Christianity up for what has happened over the last five centuries. As for the printing press and disseminating the Bible widely, that, to me, is one of the few saving graces of the last millennium or more of the downfall of Christianity. Though Western Christianity, especially, progressively departed from biblical teachings on salvation and the Atonement during that time, at least now anyone who wants to can search the scriptures for themselves, and see what the Bible actually says. In earlier centuries, when the Bible was not widely available, it was too easy for the Church simply to decree whatever doctrine it wanted to decree with no real checks and balances. From my perspective as a heavily biblically based Christian, restoring the Bible to the people was necessary for the rebirth of Christianity that I believe is currently underway as the traditional Christian Church recedes. Lee, I simply must say thank you! The clarity you bring to these issues is simply stunning and your work has had a big impact on me. I was ‘churched’ for a long time but moved away from organized religion when it conflicted with my reason, understanding of scripture, and direct revelation about who God is. Thanks for stopping by, and for your kind words, which I do appreciate very much. I’m glad the articles here are helpful and enlightening for you! If there are any particular questions you have or topics you wish to take up, feel free to leave further comments here or on any of the other posts. Hi, Lee, thanks again for the time you spend to write and share with those you don’t know! I would like to share about some revelation I have received and get yours, and your communities’, feedback. I am not sure where to post this but here goes anyway………. The following revelation has opened my understanding about who my Father is and the nature of the physical universe I am a part of. Quite frankly my new understanding has challenged me but also brought clarity. I have looked for others that have shared the understanding that I now have but have not found any clear expression to match my new understanding (must be looking in the wrong place). Last year I was praying for wisdom and considering eternity, the universe around me, and my possible place in it. In this process I studied for the first time how big the known universe is. What I learned was that what we can see, and reasonably calculate by scientific methods, is immense beyond my comprehension, millions upon millions of light years across. Filled with this new understanding of such an immense universe I began to consider spending an eternity within it….funny thing happened….a very strong fear gripped me when I realized that no matter how big the universe actually is, if I had an eternity to spend within it, I could literally inspect every molecule…eternity is a long time to spend within a finite space of any size. While I was literally experiencing a fear attack I heard ‘ silly, the universe is infinite’. Peace came on me instantly. OK, so I have an eternity to spend within an infinite universe…not so bad. Then I began to consider how my Father was able to manage an infinite universe and asked for wisdom again. I instantly remembered the scripture ‘we live, we move, and have our being within Him.’ Immediately following I was given an understanding that everything that is, all that is created, exists within the Him. Nothing exists outside of His person. My mind was blown….. I exist, live, move, and have my being, along with all creation, within an infinite God who encompasses ALL things. ALL creation, of every dimension and reality, exists within him and draws it’s life energy and essence from Him. No wonder that as Christ He declared that the rocks could cry out, they are a part of Him. I now understand that He does not need to go anywhere because everything exists within Him. He IS all things, and all things proceed forth out of His person. The clarity of understanding that I exist within an infinite universe that is contained within His person, derives it’s energy continuously from Him, and very literally exists because He is, has changed me. I don’t remember ever being taught this, is this understanding ‘scriptural’? Does this match up with your understanding? How about the understanding of Swedenborg? About your revelation, I wouldn’t say it’s exactly scriptural, mainly because such mystical ideas were largely beyond the people of the cultures in which the Bible was written. At the same time, it’s not exactly anti-scriptural either, as your reference to Acts 17:28 attests. About the physical universe being infinite, that’s something scientists are still debating. Now, with non-scientific (but not anti-scientific) theories of the multiverse, some scientists and philosophers do believe that the physical universe may be infinite rather than finite. Then there’s the spiritual universe (commonly called the spiritual world), which may or may not be infinite in scope, just as the physical universe may or may not be infinite in scope. From my perspective, what is definitely infinite in scope is the being of God. And though I don’t think of God as literally being everything, I do think of God as being in everything. To use philosophical terminology, my (and my spiritual community’s) cosmology is not pantheistic, but is panenetheistic. My belief is that while the spiritual and physical universes are distinct from God, and therefore not actually God, God is continually present in everything in the physical and spiritual universes, in all time and space and their spiritual analogs. And it can also be said that everything is in God. When Swedenborg speaks of heaven, he says that what makes it heaven is the Lord’s presence there, and that the angels there do think of themselves as living in God, because for them God is heaven. The same could be said for our physical existence here on earth, except that most people aren’t so aware of it as are the angels. Even in hell, where people live who reject God’s presence (thus making it hell), God is still present, or nothing could exist and no one could live there. But the people (evil spirits) there twist what comes from God into its opposites. They turn love into hate, patience into anger, truth into falsity, community into disunity. And yet, those opposites don’t have any fundamental existence of their own. They live with an existence borrowed from, and flowing in from, God. TL;DR: While I wouldn’t go so far as to say everything is God, I do believe that everything is in God, and God is in everything. And practically speaking, the effect for us is probably about the same: No matter where we go, God is there. I do also believe that because God is infinite, and the created universe is potentially infinite, and is at least indefinite, in scope, we will never run out of new worlds to explore—though many of those worlds will be within our own soul as much as outside and around us. Thanks Roy for your insight about organized religion. The structure of religion is needed,by many persons, but organized religion is somewhat like a rose, it is enticing and inviting with its sweet aroma, but is has sharp thorns. It seems that organized religion becomes too rigid and too authoritarian over time everywhere it is found. This ought not surprise us given that it is run by frail and fallible men who have less than perfect moral characters. I have studied the other major religions of the world off and on since college days 40 years ago. One sees abuses of their privileged place among rabbis, priests, ministers, brahmins, and imams, and even among Buddhist abbots. the idea that faith alone saves is a christian invention not a biblical one “Not everyone who says to Me, ‘Lord, Lord,’ will enter the kingdom of heaven, but he who does the will of My Father who is in heaven”. when gandhi said i like your christ but not your christians i understand what he’s saying. believing in eternal damnation for people who are of a different faith is sickening to me. the faith alone belief means hitler would be more likely to get into heaven if he believed in jesus than a holocaust victim like anne frank who said ” i am grateful to god. he’s given me a religion and love”. jesus himself was raised a jew and said we need to love our neighbour. jesus’ universal message of love, understanding, forgiveness and acceptance should be what organized christian religions preach. Thanks for your good thoughts. I agree! Then you must do away with Paul and his writings. The irony of this is, without Paul there would be no Christianity. It is not necessary to do away with Paul and his writings. Only to do away with the completely wrong and mistaken understanding of Paul and his writings in most of traditional Christianity—especially in Protestantism. Thank you for your spiritual insights and Biblical explanations. Your articles resonate with me. I remember many years ago reading “Our Daily Bread” and I still kept many issues. I am glad I found your website. Wow, a former Our Daily Bread subscriber! That’s a blast from the past! Nice to have you with us after all these years. Why do I keep reading “I will *eat you*”? Excellent breakdown of the problems with Protestant doctrines of salvation. Calvinist ideas about heaven and hell have always struck me as particularly cruel, as it removes even the choice of believing in Christ. On the subject of salvation and heaven, what does Jesus mean in Luke 7:28 when he says, “I tell you, among those born of women there is no one greater than John; yet the one who is least in the kingdom of God is greater than he”? I assume this has to do with the idea of being born again in spirit, but apart from that, I’m a bit lost. The simplest meaning is that angels in heaven live a life that is a whole order of magnitude higher and greater than what even the best people here on earth can live, simply because they are living in the spiritual world rather than in the material world.